Many people, from teens to adults, are searching for the answer to their acne problem. While acne affects around 80% of teens, it is not limited to that age group and many adults find themselves faced with problem skin, sometimes for the first time in years. Contrary to popular belief, an acne problem doesn`t occur because someone is dirty or eats chocolate. Acne is a result of your body`s natural processes. Acne or pimples are caused due to hormonal imbalance. The skin tends to break out due to a hormone called testosterone. The skin glands produce oil to keep your face and other areas moist. As new skin cells are generated, the skin rids itself of dead skin cells. An acne problem occurs because more oil is produced than the skin can efficiently shed, causing the pore to become clogged. If the clogged pore opens directly to the skin`s surface, you get a blackhead. If the clogged pore has a layer of skin over it, you`ll get a whitehead. Acne occurs when the clog is deeply inside the pore. Bacteria begin to multiply in the pore and a blemish develops. Different types of blemishes can develop as part of an acne problem. Blackheads occur when the pore is open and the plug is exposed and becomes dark in color. Whiteheads are blemishes where the skin is closed over the plug. Blackheads and whiteheads are forms of light, non-inflammatory acne. Nodules and a cyst is a more serious type of acne called inflammatory acne. Nodules are inflamed blemishes with a solid plug deep in the pore. Cysts are painful, inflamed blemishes which contain pus. This type of acne often leads to scarring. Fortunately, there are a number of excellent options for the care and curing of acne prone skin. There are several medications available to deal with an acne problem. Treat acne with benzoyl peroxide, an antibacterial, combined with salicylic acid (also known as beta hydroxy), an exfoliant. Benzoyl peroxide comes in a soap or ointment, like Clearasil. Salicylic acid derives from aspirin and comes in a cream form. These measures are taken for teenage acne and they dry out the skin. If you`re not a teenager, try Oil of Olay Age-Defying Lotion. You can also get topical antibiotics such as erythromycin or tetracycline from your doctor. You can disguise a pimple with eye-redness reliever drops. Even Antibiotics can control bacteria growth, preventing breakouts from occurring. Retinoids help keep pores open and clear. 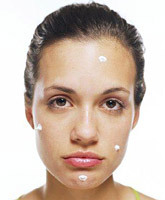 Birth control pills have also been shown to be an effective weapon in the fight against acne. Even a variety of antibiotics such as tetracycline, doxycycline, erythromycin and minocycline can be used to kill acne-causing bacteria. Along with an acne blemish treatment, there are a few guidelines you can follow for caring for your skin. Never squeeze blemishes. Squeezing can force the bacteria deeper into the pore, making the blemish worse and possibly causing scarring. Use a gentle cleanser to clean your skin, but don`t overdo it. Washing your face any more than twice a day is too much and can dry and irritate your skin, possibly worsening the acne. Also, avoid touching your face, which can introduce bacteria onto your skin. More than one million cases of the curable skin cancers are diagnosed this year. To insure your skin is safe from UV rays, make sun protection a daily habit and a part of the ritual of going to the pool, beach, park or even the mailbox. The best thing to do is to use a sunscreen, even if you can`t see the sun. So, what are these UVA rays? They can be explained as the long-wave solar rays that can pass through window glass. They are 20 times more abundant than UVB rays. They are the same strength all year round - it does not matter how close or how far away the sun is from the earth. It is considered as the chief culprit behind wrinkling, leathering, and other aspects of "photoageing". Prolonged exposure to UVA cracks and shrinks the collagen and elastin, causing the skin`s epidermis (top layer) to droop or hang off the body. Over time, UVA rays dilate blood vessels permanently, giving a constant red flush to the skin and causing white and brown patches. After UVA rays, let us see what are the UVB rays; they are the short-wave solar rays that cannot pass through window glass and are more potent than UVA rays in causing sunburn. It has long been considered the "tanning ray", and is strongest in the summer months when the earth rotates closest to the sun. However, the strength of UVB rays varies with the season and weather. They are more intense in the summer than in the winter, and at mid-day than in the morning and are more intense at high altitudes and near the equator. Limiting sun exposure. Stay out of the sun between 10 am and 4 p.m. when the UV rays are strongest. Sunscreen guards against ageing. Use it daily. A minimum of SPF 15 is recommended for everyone. Also, wear protective clothing such as wide hats, long sleeved blouses and shirts, and slacks to keep your skin protected from the harsh sun. Wear sunglasses, so that you don`t squint and develop crow`s feet at an early age. Protect your eyes with sunglasses that block UV rays. Remember that the effects of sun exposure are cumulative. Protect babies and children`s tender skin.